Resident, commuters, long distance travellers and businesses all use the A120. But how much? Road users often speak about congestion at key junctions, causing longer journey times, but how and where is this happening? Which leads to the big question; why is this happening? All of these questions have been investigated by the A120 feasibility study project team. The team have created a full technical report detailing their findings and are using this information make sure that A120 route options developed are targeting evidence based issues. Our study has shown that today between 21,400 and 25,400 vehicles use this section of road every day. Up to 43% of this traffic is local journeys, while up to 68% is long distance journeys where road users are traveling to the motorway network or other major roads. The highest volume of traffic during peak periods are at each end of the corridor and the lowest on the dual carriageway around Coggeshall. At Galley’s Corner and Marks Farm during peak periods most traffic is moving ‘though’ the junction (remaining on the A120) in both directions. Congestion is a key issue for road users and on the A120 during the morning and afternoon peak period congestion can reduce the speed of your journey by up to 47%. The volume of traffic is starting to overwhelm junctions and push the road past its operating capacity. By 2024, it is estimated that the corridor between Braintree and the A12 will be operating well over capacity. The table below summarises the traffic issues and underlying causes, more information on can be found in part two of this article. Need to support economic growth and strategic developments such as Harwich International Port and Stansted Airport. Economic growth is a policy directive at Local, Regional and National levels. Need to accommodate travel demand associated with future housing and jobs. Increased housing and job allocations emanating from the emerging local plans in Essex and in particular in Braintree District, with 14,000 additional houses and 10,000 additional jobs. Significant congestion related delay on the corridor as a whole, with journey times taking up to twice as long in peak periods compared to off-peak periods. Link and junction related congestion in particular at the junction at Galley’s Corner roundabout and Marks Tey roundabout and on the links between B1024 Colchester Road and the A12. Significant congestion related delay on links between B1024 Colchester Road and the A12 during multiple hours of the day. Lack of capacity relative to current traffic volumes, high car usage due to lack of attractive alternatives and long average trips distance to work due to large outflow of commuters from Braintree District. Severe delay and queuing at key junctions of Galley’s Corner roundabout and Marks Tey roundabout. Poor journey time reliability over the whole corridor and during six hours in the eastbound direction and three hours in the westbound direction, with particular sections considered unreliable during the entire analysis period of 0700 to 1900, in particular on the approaches to Galley’s Corner roundabout and between the B1024 Colchester Road and the A12. Significant congestion related delay resulting from a lack of capacity relative to travel demand and poor resilience associated with the narrow carriageway and lack of information on incidents. Poor resilience of the corridor. Congestion, narrow carriageway width and lack of information on incidents. Corridor link infrastructure operates over-capacity during up to 5.75 hours per day leading to congestion related delay and poor journey time reliability. Narrow carriageway width relative to traffic volumes (lack of capacity) with a high proportion of HGVs. Lack of capacity at Galley’s Corner roundabout and Marks Tey roundabout. High peak period traffic flows. Severance of several villages on the corridor including Bradwell, Broad Green and Marks Tey. The A120 is part of the SRN and has relatively high traffic volumes and proportion of HGVs and passes directly through urban areas. High levels of car usage, with 74% of journey to work trips by usual Braintree District residents by car. Lack of attractive alternatives to car and long average trip distance to work due to large outflow of commuters from Braintree District. Car use is generally more attractive (time and cost) than bus and rail travel in the corridor. Lack of direct rail links and bus priority measures. Congestion related delay can reduce local air quality and high traffic volumes through urban areas increase noise. The A120 is part of the Strategic Road Network and has relatively high traffic volumes and proportion of HGVs and passes through villages such as Bradwell, Broad Green and Marks Tey. Limited potential to provide access to new developments. Lack of capacity of the transport system to absorb additional traffic. Poor safety record of the corridor. High collision rate on the A120 relative to UK rural single carriageway rate including pedestrian and cycle collisions. Poor quality NMU infrastructure, including absence of cycling facilities, poor connectivity and standard of pedestrian infrastructure and poor connectivity of bridle-ways. Lack of space for NMU facilities within existing A120 corridor highway boundary. Essex Transport Strategy: the Local Transport Plan for Essex (LTP3, June 2011) states that: “Our vision is for a transport system that supports sustainable economic growth and helps deliver the best quality of life for the residents of Essex”. The Essex County Council (ECC) Key Corporate Outcomes Framework 2014-2018, states the commitment to providing sustainable economic growth for Essex communities and businesses, and delivering increased connectivity and journey time reliability on the Priority Route (PR1) Network, of which the A120 between Braintree and Marks Tey is a vital component. The ECC Vision for Essex, July 2013-2017, pledges that ECC work tirelessly to keep Essex as an economic powerhouse ensuring more jobs are created and local businesses supported, and to achieve that ECC must develop and maintain the infrastructure that enables its residents to travel and businesses to grow. The Greater Essex Integrated County Strategy, December 2010, states that growth based around the A120 will be an important characteristic of growth in the Haven Gateway sub-region. The Essex Transport Strategy LTP3 identifies key priorities that relate specifically to the A120. 1.2 Who uses the A120? Local people – those who live and work in Braintree Town or Colchester or those who use part of the A120 (such as roundabouts) for part of their journey. Long distance (strategic) travellers – the people who use the A120 as part of a longer journey. These people will generally not stop on the A120 during their journey. 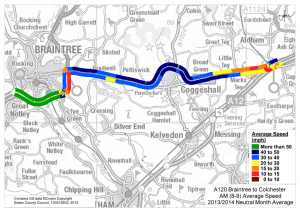 The following highlights that over half of traffic on the A120 corridor between Braintree and the A12 is through traffic, which includes traffic between Braintree Town and the A12, in the order of 58% to 68% when looking at the composition at each end of the corridor. It should be noted that business traffic, and therefore Heavy Good Vehicles (HGV) were not considered in this calculation. We have looked at how, why and where people travel in terms of mode, purpose and destination. To help inform this, we have used information from the England and Wales Census 2011. Long distance travellers include those travelling to or from Stansted Airport, Harwich International Port, and Port of Felixstowe. People travel from London, the west and north of England. Most of the strategic travellers use the A120 east of Marks Farm. We know that most of traffic on the A120 at Marks Tey travels to and from the north on the A12, especially in the morning and evening peak hours. Only a small proportion of traffic travels to/from the A12 south. Cars are the most common form of transport on the A120. About 70% of local people travel to work by car in Braintree. Public transport options include bus and train which have low usability. Driving is quicker and costs less than taking public transport. Delays, which are because of significant congestion. This is because of the current volume of traffic and the capacity of road and its junctions to cope with the traffic. Traffic congestion especially happens at junctions during peak travel times (morning and evening). Specific junctions where there are problems are at Galley’s Corner roundabout and Marks Farm roundabout. This causes delays on the rest of the network. Unreliability of the A120, especially between the A131 and A12 in both directions. Less than 95% of journeys arrive within 20% of the average journey time. Lack of resilience. This means that the A120 is less able to respond to unexpected changes, such as vehicle break downs, extreme weather, road construction and maintenance, or major events. The following goes a bit deeper into the current traffic issues. 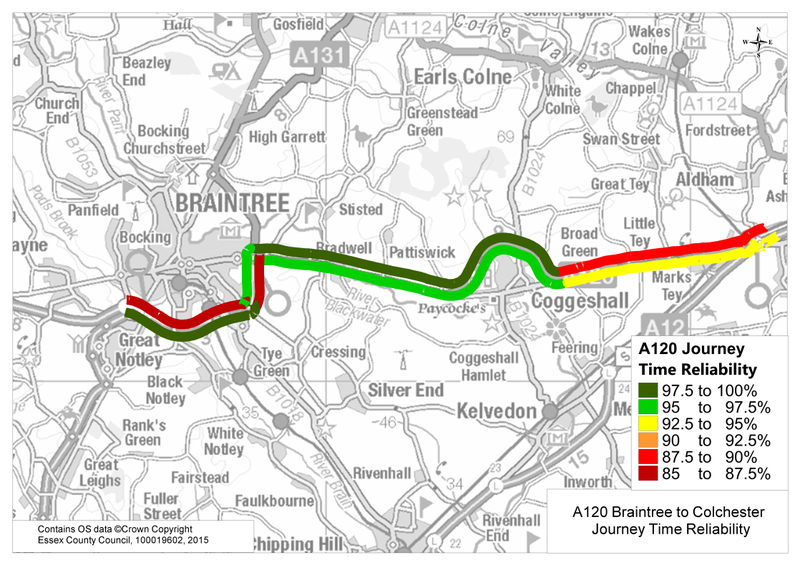 Trafficmaster data supplied by the Department for Transport (DfT) has been used to gain an understanding of the speeds and delays experienced along the A120 from Braintree to Marks Tey. The data used for the analysis consists of at least 80,000 observations for each hourly period during neutral months from September 2013 to August 2014. The section of the A120 analysed extends from the A131 at Great Notley to the A12 at Marks Tey. It is about 13.0 miles in length in the westbound direction and 12.8 miles eastbound. Average speed and journey time when considering the entire length of the corridor are shown in Table 2. Journey times are highest in the eastbound direction travelling from the A131 junction towards the A12 in the evening peak hour between 1700 and 1800, taking just over 30 minutes to travel the entire corridor at an average speed of 25 mph. This compares to an average free flow journey time of about 16 minutes at 47 mph. In the morning peak hour, the journey takes about 22 minutes eastbound and 25 minutes westbound compared to about 16 minutes and 17 minutes respectively at free flow speeds. The variation in speed along the corridor is shown in for both the AM (0800-0900) and PM (1700-1800) peak hours in Figure 1 and 2. Journey times are comparatively high on the approaches to Galley’s Corner roundabout on the Braintree Bypass. Journey times are significantly higher between the B1024 and Marks Tey roundabout during both peak hours and in both directions, in particular the eastbound approach to Marks Tey roundabout. This suggests that the overall corridor journey times are being significantly impacted upon by conditions at Galley’s Corner roundabout, Marks Tey roundabout and through the entire section between the eastern end of Coggeshall Bypass and Marks Tey roundabout. Congestion is a result of delay caused by other road users on the network relative to the capacity of the roadway, characterised by slower speeds and longer journey times. A congestion indicator was calculated as a percentage of peak hour speed (between 7-9am and 5-7pm) compared to free flow speeds (outside of peak hours, when not impeded by traffic). The congestion indicator is calculated as the average journey time between 2000-2400. Table 2 shows the congestion indicator for the peak periods on the A120 between the A131 and the A12. It shows that between 5-6pm, eastbound traffic is 53% of the free flow speed. This means that the average journey time in the peak hour is almost twice as long as the free flow journey time. Table 3 also shows that congestion affects eastbound and westbound journey times between 7-9am. Journey time reliability is a measure to capture the variation in journey times that travellers are unable to predict. Journey time reliability for this study is defined as a percentage of ‘on-time’ journeys in each separate hour between 07:00 and 19:00, based on observations for 246 days between September 2013 and August 2014. To be ‘on-time’ the journey must be within 20% of the average journey time for that hour. The benchmark for Essex Priority Route 1 (PR1) inter-urban network is 95% of journeys ‘on-time’ during the 12-hour period, with routes below 95% classified as ‘unreliable’. Both the eastbound and westbound direction of travel on the A120 is unreliable, with less than 95% of journeys arriving within 20% of the average journey time for the hour in which they were undertaken. This is shown in Figure 3. Daily two-way traffic volumes (AADT) along the corridor between Marks Farm and the A12 at Marks Tey are relatively consistent, varying between about 21,400 and 25,400 vehicles per day. The proportion of heavy goods vehicles on the corridor is also relatively constant between Marks Farm roundabout and the A12 varying between 11.7% and 13.3% of AADT (using the definition in TRADS of HGVs of greater than 5.2 metres in length). Peak hour traffic volumes (June 2014) are also relatively consistent and vary between about 1,950 and 2,300 two-way in the morning peak hour (0730 to 0830) and 1,670 and 2,160 in the evening peak hour (1700 to 1800). There is a high proportion of HGVs on the corridor with between 11.7% and 13.3% of AADT. In the morning peak hour the proportion of HGV’s is particularly high at 13.7% to 15.0%, when their impact on congestion is also more significant. This compares to 7.6% to 8.9% HGVs in the evening peak hour. In general, traffic volumes are highest at each end of the corridor and lowest on the Coggeshall bypass section in the middle. It is worth noting that the morning peak hour time of 0730 to 0830 varies little along the corridor while the evening peak time period is much more variable depending on the location, with the start of the peak hour varying between 1530 and 1700. There is relatively low variation in directional split by peak hours, with the westbound movement towards Braintree Town in the morning that returns in the evening peak being the slightly dominate direction. On the dual carriageway section between Galley’s Corner roundabout and Marks Farm roundabout the AADT is about 38,100 two-way with about 11% of HGVs. Two-way peak hour flows are about 2,840 in the morning peak hour (0730 to 0830) although the westbound direction peak is an hour earlier, while the peak hour flows in the evening (1700 to 1800) are about 3,050 vehicles per hour. The highest peak hour turning movements at the Galley’s Corner roundabout are by far the “through” movements along the A120 in both directions, representing 47% of traffic entering the roundabout in the morning peak hour and 42% of traffic in the evening peak period. The highest peak hour turning movements at the Marks Farm roundabout are also the “through” movements on the A120 between the southern and eastern approaches in both directions. This represents 41% of traffic entering the roundabout in the morning peak hour and 37% of traffic in the evening peak period. There are also significant traffic flows entering the A120 corridor from Braintree Town during both peak periods at Marks Farm roundabout. This implies that solutions to congestion at the above junctions need to address the major A120 through movement. The majority of traffic on the A120 at Marks Tey entering/leaving Jn 25 travels to/from the north on the A12. Only a small proportion of traffic travels to/from the A12 south. More specifically in the morning peak hour 76% of traffic on the A120 at Marks Tey travels to/from the A12 to the north, compared to 11% associated with travel to/from the A12 south and 13% with the B1408. In the evening peak hour 71% of traffic on the A120 at Marks Tey travels to/from the A12 north, 11% to/from the A12 south and 18% is associated with the B1408. Public transport travel is not competitive with car travel, even for journeys with origins and destinations that are located within a two minute walk of a station. Journey times from Braintree Town to Colchester Town are about 10% slower by bus. All other routes are considerably slower, especially between Great Tey and Braintree Town where the journey time by bus can be twice as long. Rail is slower (and more expensive) than both bus and car for the Braintree Town to Colchester Town route. Why does the current traffic situation need to be addressed? 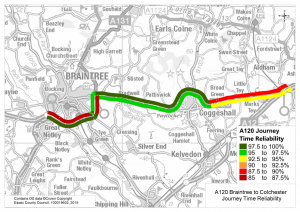 The transport related problems and underlying causes outlined above would all be exacerbated over time as the demand for transport on the strategic A120 corridor increases. The vision for Essex is for a transport system that supports sustainable economic growth and helps deliver the best quality of life for the residents of Essex. Braintree Town is identified as a main town and a future growth area. Colchester is a regional centre and Stansted Airport and the ports at Harwich and Felixstowe are located nearby. The traffic issues need to be addressed to achieve the vision for Essex for a prosperous future. The current significant level of congestion related delay and poor journey time reliability experienced on the section of the A120 between Braintree Town and the A12 at Marks Tey will increase as a result of future increases in traffic volumes resulting from increased demand for travel relative to the available supply of roadway capacity or public transport provision. The following provides a description of the key potential future impacts of not addressing the transport related problems and their underlying causes as identified in the previous section. Constraint on future growth in the region and locally. 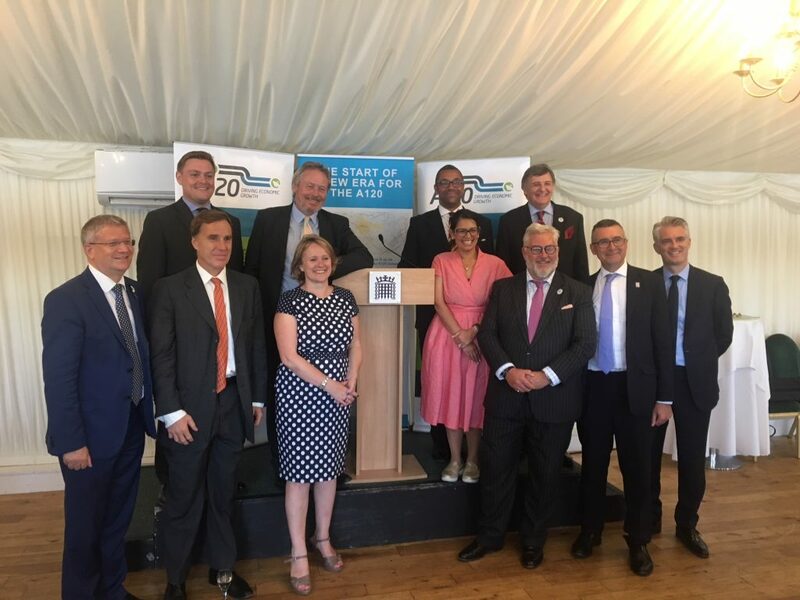 (A study by Peter Brett titled A120 Economic Impact Study (2013) has identified that the constrained scenario of maintaining the current standard on the A120 is likely to result in a loss of £1.1 billion in Gross Value Added (GVA) compared to the current trend). A barrier to growth for strategic developments in the region including Stansted Airport (London Stansted Airport: The UK’s Southern, MAG, 2013) and the Haven Ports – particularly Harwich International Port. Exacerbated impact of incidents such as collisions and maintenance on journey times. Re-routing of traffic via less appropriate roads, increasing stress on the wider road network. Constraint on growth of local businesses due to the increased cost of travel. Constraint on the planned growth in housing and jobs in Braintree District and surrounding Districts. Increased cost and time for local residents to access employment. Increased cost and time for local residents to access essential services such as hospitals, education and shopping. Reduced local air quality in villages along the corridor due to increased congestion. Increased impact of noise and severance on residents of villages along the corridor. The current state of the preparation of the emerging local plan for Braintree District, Colchester Borough and Uttlesford District, which is ongoing with specific development proposals not yet to be approved. The ‘without-scheme’ scenario in terms of the transport system is likely to be largely defined by ongoing work by AECOM on behalf of Highways England, who are looking at online and relatively short-term local solutions to current issues on the A120 corridor. It is felt that the need for intervention can be established based on the scale and significance of current problems. The following provides an overview of issues that will influence future traffic. Strategic Transport Priorities: Lobbying Government for enhancements to the A120 to access Harwich port and between the A12 and Braintree. 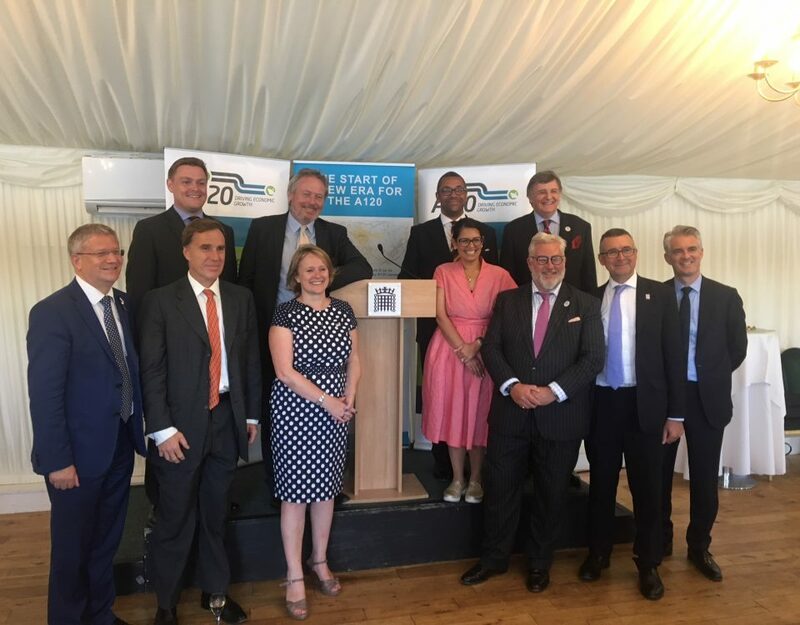 Longer term dualling of the A120 would improve connectivity across northern Essex and provide essential network resilience for traffic accessing the Haven Ports by providing an alternative to the A12 and A14 in line with TEN-T22 ambitions to improve network efficiency. Growth Locations for housing should be located at the Main Towns of Braintree and Witham only. More limited development to serve the local area, or deal with specific local issues such as the regeneration of important sites, can be located in the Key Service Villages (Coggeshall, Earls Colne, Hatfield Peverel, Kelvedon, Sible Hedingham and Silver End). Apart from the identified Growth Locations, the open countryside between the Main Towns, Key Service Villages and Other Villages should be kept undeveloped. The current and emerging local plans for Braintree District identify more specifically the quantity and location of new housing and jobs and are outlined in the following section. Figures 3 and 4 show traffic flows and network stress in 2024 during AM and PM peak hours. This is based on assumptions made on traffic growth for the estimated opening year (2024). 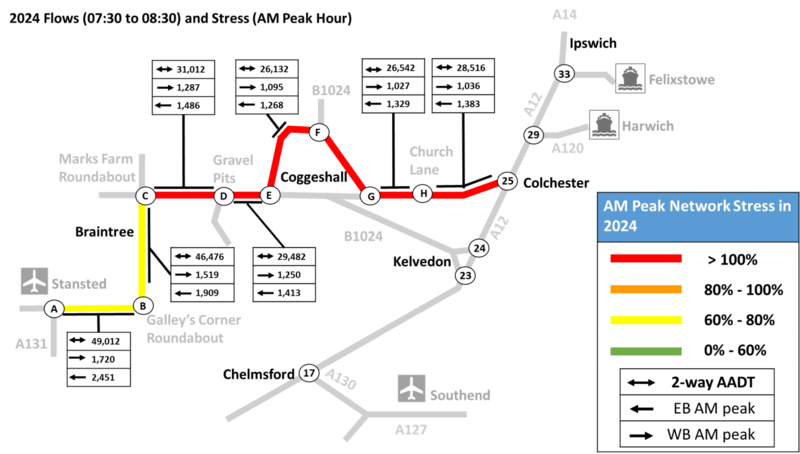 The A120 between Marks Farm roundabout and the A12 would be operating well over capacity during the morning peak hour and roughly at or mostly above capacity during the evening peak hour. This situation only becomes worse with additional traffic growth from 2024 to 2033. 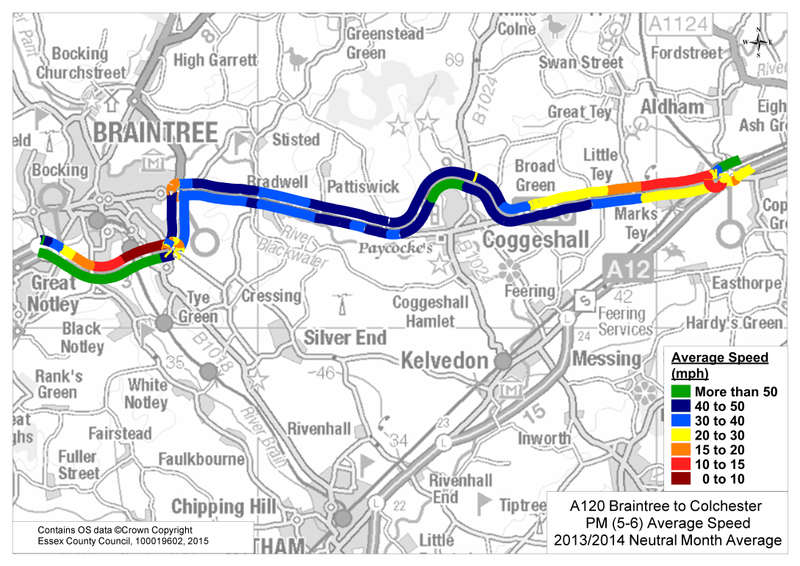 The dual carriageway section on the Braintree Bypass has adequate capacity in 2033. Average speed on A120 between Galleys Corner and Marks Tey Roundabout in the peak period indicated, expressed as a percentage of the average free-flow speed.